The options for haemostasis and dissection during modern thyroid surgery include the use of a bipolar vessel sealing system and ultrasonic technology. The aim of this study was to compare these energy-based devices (EBDs) with respect to their use in open thyroidectomy. The FOCUS Shear (F) and LigaSure LF1212 (L) were evaluated. A total of 182 consecutive patients scheduled for open thyroidectomy were prospectively randomised into two similarly sized groups. The parameters of operative time, morbidity, incision length, postoperative pain and hospital stay were analysed. The main clinically primary endpoints of the two devices were identical in the study as the rate of nerve lesions, bleeding, drainage, operative time and postoperative calcium concentration with no significant differences with respect to the instrument utilised. The mean length of the incision was greater in the F group (p < 0.05). Patients in the F group were more likely to complain of pain while swallowing (p < 0.001). Early postoperative measurements of intact parathyroid hormone plasma levels revealed that although the levels were within the reference range, they were significantly lower in the F group (p < 0.001). Oral calcium supplementation was significantly higher and more prolonged in the F group. The present study demonstrated no significant difference in the rates of postoperative morbidity associated with these two different EBDs used. Differences in clinically less significant were founded and focused on. 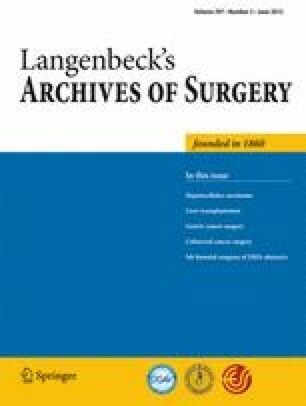 This contribution has been pre-selected for publication by the European Society of Surgery (ESS), and the material was presented at the 15th annual meeting of the ESS, 17–19 November 2011, Krakow, Poland, in the LAS Award Session. The authors are grateful to Kimberly Krugman for general support, technical assistance and helpful discussions. Authors and institutions mentioned in this study do not have any competing interest. This specific report does not endorse any specific company. Johnson and Johnson which manufactures the FOCUS device provided the instrument. Covidien which manufactures the LigaSure provided the instruments. Medtronic provided the monitoring device. The protocol was formally approved by an independent local institutional review board of the Department of Surgical Sciences, University of Insubria (Varese–Como), Italy.